THIS was a winner-take-all clash with a place in the quarter-finals of the SFC up for grabs. The sides had met twice previously in the league this season with Downpatrick winning one and drawing the other, but championship football is a different kettle of fish and both camps knew they were in for an epic battle. Downpatrick had to field without regular goalkeeper James Deeny after he injured his wrist in the build-up, but his younger brother Jonathan proved a more than capable replacement. The Hoops were also without powerhouse midfielder Peter Turley and lieutenants Sean Bell and Caolan Boyd, but they seized the early initiative with Ruairi Quinn firing over the game’s opening score. Donnan equalised for Rostrevor before two frees from the reliable Magee gave Downpatrick a 0-3 to 0-1 lead, but a John Fegan 21m free left a single point in it. Two points from Johnny Bell and another on the stroke of half-time from Conor McGrady gave Downpatrick a 0-6 to 0-2 lead at the break. With Turley missing, manager Conor Deegan handed his shirt to Peter Telford and although he injured his shoulder late on, he did enough to suggest that he could have a significant impact on Downpatrick returning to the top flight. His points from play five minutes after the break gave Downpatrick a five point lead, but a stunning score from Donnan reduced the arrears to four. Magee and Mackin exchanged points as the respective defences held firm with Downpatrick’s Anthony Doherty a colossus at full back. Rostrevor continued to chip away at Downpatrick’s lead with renewed and two points from Fegan left two in it. 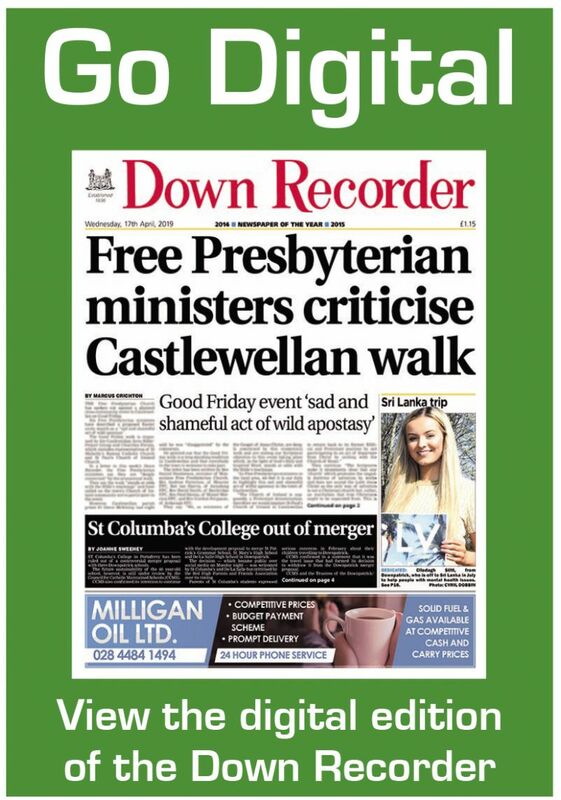 Downpatrick lost the services of Paddy Smyth and Conail MacNabb within minutes of each other as they walked the walk after picking up black cards. This only seemed to spur Downpatrick on and a majestic point from Gerard Collins made it a three point game. The game took another unexpected twist when McGrady was red carded for an off the ball offence and points from Fegan (0-2) and Magee sent the game to extra-time. Conor Deegan has a rare knack of getting the best out of his players and points from Boyd and Eoin Boyle put Downpatrick in the ascendancy again. Rostrevor refused to go away and points from Connolly and Fegan levelled matters yet again. 45m free to make it all, square. Points at the start of the second half from Magee and Boyd gave Downpatrick some breathing space, but a point from Reynolds left the minimum between the sides. Marty Robinson took the game by the scruff of the neck in the dying stages and after a darting run through the heart of the Rostrevor defence split the posts with an insurance score for Downpatrick. Downpatrick: Jonathan Deeny, P Smyth, A Doherty, D Braniff, C MacNabb, G Collins (0-1), J Bell (0-2), K Gracey, P Telford (0-1), M Magee (0-5), O McEvoy, C McGrady (0-1), R Slavin, T Loudon, R Quinn (0-1). Subs: C Boyd (0-2) for MacNabb, R Fitzpatrick for Smyth, C Doherty for Slavin, M Robinson (0-1) for Gracey, E Boyle (0-1). Rostrevor: J Fearon, D McIlhinney, J Rice, J Farrell, C Gordon, N Farrell, J Connolly (0-1), D Magee, D Magee, C Mackin (0-1), P Kane, A McMahon, A Donnan (0-2), J Fegan (0-6), A Mackin. Subs: P Magee (0-1) for McMahon, J Parr (0-1) for Fearon, M Murray for C Mackin (black card), A Reynolds (0-1).